I have always hated KB Toys, and I have honestly only been the store three times in my life. I’ve searched the packed shelves of junk toys for a glimmer of something that I could give my children that was not made of plastic, commercialized, oversexualized, gender specified, or Chinese made. Thus, I was not saddend to hear this junk toy store was going out of business. KB blamed the difficult economy for the filing, but toy industry experts said wrong decisions by the retailer hastened its demise. It had shifted its focus to mall-based stores, saddling itself with high rents just as shopping-center traffic was dropping; it stopped selling video-game consoles; and it moved its merchandise mix away from hot toys and toward closeouts. There really is no justifiable reason to leave such garbage on the streets after a store’s closing. It also further demonstrates what junk toys the store sold if they do not care enough to dispose of them properly when liquidating. Why weren’t the unsold toys donated to homeless shelters, orphanages, or hospitals? 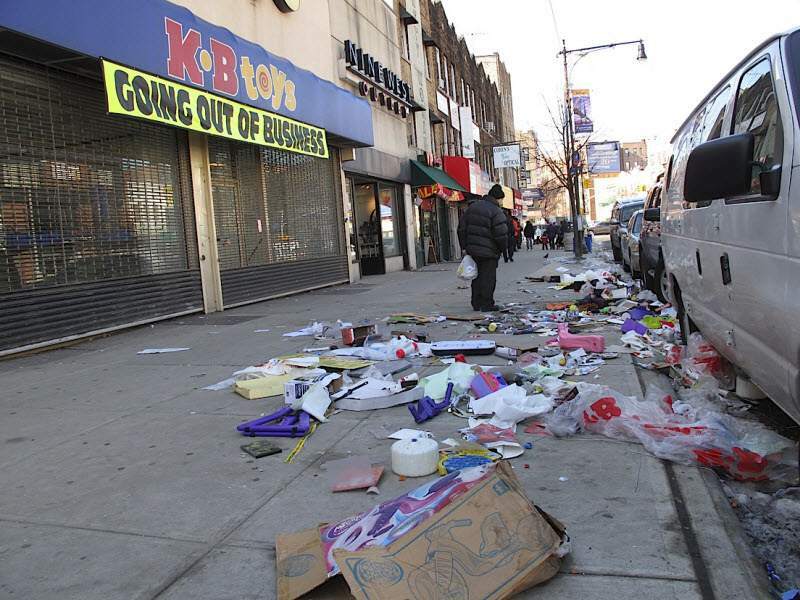 It is such a waste and disgusting to see rubbish all over the streets like this, although it doesn’t look that much different than the inside of KB Toy store. ever think that garbage was filled in those giant plastic bags (shown in the picture empty, but then people on the streets ripped them open to see if they can score free toys. and hell, even if they just threw their garbage on the streets, take it up with gordon brothers since they oversaw the liquidation, and these employees were losing their jobs, id like to see what you would of done if that was you.